Gibbs Smith, September, 2008, by photographer, writer and committed vegan, Linda Long. In her new book, Long highlights recipes from 25 of today’s top chefs, many are James Beard award-winners. Chefs include Alex Stratta, Anne Quatrano, Bradford Thompson, Cat Cora, Charlie Trotter & Matthias Merges, Dan Barber, Daniel Boulud, David Burke, Eric Ripert, Erik Blauberg, Floyd Cardoz, Gabriel Kreuther, Jason Cunningham, Jean-Georges Vongerichten, John Besh, Jose Andres, Josef Huber, Marcus Samuelsson, Matthew Kenney, Michel Nischan, Phil Evans, Suzanne Goin, Terrance Brennan, Thomas Keller and Todd English. Each chef section of Great Chefs Cook Vegan includes a three or four-course vegan meal, prepared by the chefs, complete with mouth-watering photographs of each recipe. These delicious vegan recipes include Baby Beet Salad with Pistachio Vinaigrette and Chickpea Fritters, Sweet Pea Ravioli with Sauteed Pea Leaves, Stuffed Baby Bell Peppers with Sunflower Seed Risotto, and Chocolate Cake with a Chocolate Truffle Molten Center. Now, with instruction from the great chefs themselves, anyone can create a delicious vegan meal. For more information or to request an author interview, please feel free to contact me anytime. Linda Long has had a lifelong relationship with the food industry, starting as a waitress and short order cook at the age of 12 in her parents’ truck stop in Pennsylvania. 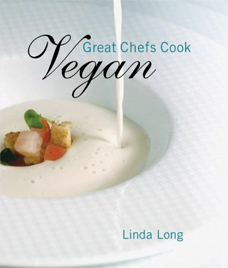 A home economist who taught high school foods in the early part of her career, and spending a decade in the resort hotel business, Linda has been a committed vegan for over half her life.